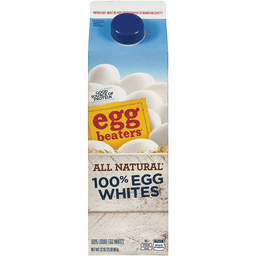 Eggbeaters® All Natural 100% Egg Whites 32 oz. Egg Beaters® 100% Egg Whites. *No artificial ingredients, minimal processing. Good source of protein. All natural*. USDA inspected egg products. 100% liquid egg whites. Per 3 tbsp serving: 25 calories. 0g sat fat, 0% DV. 75mg sodium, 3% DV. 0g sugars. Good source of protein ...1/2 the calories. Calories, Egg Beaters 3 tablespoons: 25 - 1 large egg: 70. Fat (g), Egg Beaters 3 tablespoons: 0 - 1 large egg: 5. Cholesterol (mg), Egg Beaters 3 tablespoons: 0 - 1 large egg: 185. Protein (g), Egg Beaters 3 tablespoons: 5 - 1 large egg: 6. For use in recipes: 3 tbsp = whites of 1 large egg. 1/3 cup = whites of 2 large eggs. 3/4 cup = whites of 4 large eggs. Equivalent to the whites of 20 large eggs. Egg Beaters® 100% egg whites are all natural: just one serving is a good source of protein and has 1/2 the calories of a shell egg. Egg white scramble sandwich. Find delicious recipes & cooking directions at www.eggbeaters.com. ConAgra Foods®. Food you love. Pasteurized. Gluten free. Weight Watchers® PointsPlus® value: 1*. *The PointsPlus® value for this product was calculated by ConAgra Foods, and is provided for informational purposes only. This is not an endorsement, sponsorship or approval of this product or its manufacturer by Weight Watchers International, Inc., the owner of the Weight Watchers® and PointsPlus® registered trademarks. United Egg Producers Certified. Produced in compliance with United Egg Producers* animal husbandry guidelines. www.uepcertified.com. Questions or comments, visit us at www.eggbeaters.com or call Mon.-Fri., 9:00AM-7:00PM (CST), 1-800-988-7808 (except national holidays). Please have entire package available when you call so we may gather information off the label.